Hotels-New-Zealand is a group of independently owned and non-related hotels, motels and serviced apartments providing accommodation located across Hamilton New Zealand. Hotels New Zealand allows you to deal directly with the hotels giving you the best possible rates for these Hamilton hotels. Book your accommodation online directly with the hotels in Hamilton and save !!! The Ambassador Motel has a wide range of hotel facilities designed to make sure that your stay in Hamilton is both relaxing and enjoyable, including a swimming pool, barbecue area, 24 hour reception, licensed restaurant and cocktail bar, children's playground, room service, guest laundry and ample off street parking. The Ambassador Motor Inn provides Hamilton accommodation close to the major sporting and recreational facilities in the city. Corporate business travellers and holiday guests looking for a affordable Hamilton accommodation will appreciate the comfortable and well equipped rooms at the Ambassador Motel. The Sudima Hotel Hamilton provides boutique, affordable studio and self contained apartment suites which are located in the central heart of downtown Hamilton. Ideally located on the most popular city street in Hamilton the Sudima Hotel Hamilton is only a few steps from the picturesque banks of the Waikato River and a short distance cafes, restaurants and the central business district. There are relaxing Waikato river walks just across the road and the Sky Riverside Casino is one minute away from this budget Hamilton accommodation. With a range of executive studios, one bedroom apartments abd two bedroom suites the Sudima Hotel Apartment Suites is perfect for leisure and corporate travellers looking for either short or long stay. The Sudima Hotel Hamilton also offer a range of hotel services to meet your accommodation needs including room service, airport transportation, FREE secure car parking, wireless internet connection, business services, guest laundry and complimentary newspapers. Friendly staff and superior facilities in a convenient location makes the Sudima Hotel Hamilton the ideal leisure or corporate accommodation in Hamilton. The Grosvenor Motor Inn offers elegant and tasteful motel-style Hamilton accommodation situated in the heart of the Waikato region of New Zealand's North Island. Ideally positioned just 5 minutes from the city centre the Grosvenor Motor Inn offers a range of accommodation in Hamilton to suit the needs and budget of all types of travellers whether they be on a family vacation, weekend break or business trip. The Grosvenor Motel's central location places it only 500 metres to the Waikato Stadium as well as numerous shops, restaurants and cafes. There is also a licensed restaurant on site, cooked or continental breakfast available, room service, heated indoor swimming pool, guest laundry, internet kiosk and ample off-street car parking at this budget Hamilton accommodation. The Camelot Motor Inn is conveniently situated on the main northern route into Hamilton. The complex offers a range of Hamilton accommodation options that have been designed to suit the corporate traveller, holiday maker, sports teams and large family groups. The Camelot Motor Inn is located in the centre of town, within walking distance from the CBD, Rugby and Cricket Stadiums. This Hamilton accommodation is positioned well back from the busy street, which makes it a quiet and peaceful place to stay. At the Camelot Motor Inn there is a solar-heated swimming pool, spa, trampoline, gym, barbecue, laundry, freezer storage and free car parking for guests to make the most of. Hamilton itself is a wonderful hub from which day trips to many of New Zealand's best known attractions can be made. Situated in a central location and offering clean, spacious and friendly Hamilton accommodation the Lake Point Motel is perfect for both business and leisure travellers. Visitors staying in this discount Hamilton accommodation can walk to the vibrant downtown restaurants, cafes, bars, theatres and shops or stroll around the picturesque lake Rotoroa. The Lake Point Motel is also located close by to the larger hospitals, clinics and sports facilities. All of the studio, twin share and bedroom units are serviced daily and some of them even include large fresh-fill heated spa baths. Providing quality Hamilton accommodation with great hotel facilities and friendly service The Lake Point Motel caters for all travelers from the overnighter to those requiring long term accommodation. The Kingsgate Hotel Hamilton offers travellers comfortable and affordable hotel accommodation in Hamilton, only a few minutes drive from the city centre. Situated next to the Te Rapa racetrack this fabulous Hamilton accommodation provides a little extra luxury with its fully equipped gymnasium, 3 spa pools, heated tidal flow swimming pool, 2 steam rooms and ample free car parking. 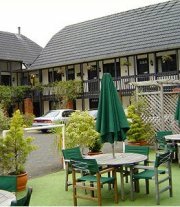 The Kingsgate Hotel Hamilton also has 2 licensed restaurants with full room service, air-conditioning and Sky TV. For value for money Hamiton accommodation look no further than the spacious, quality accommodation at the Kingsgate Hotel Hamilton. 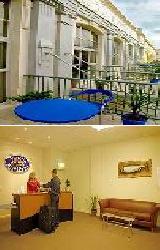 Whilst you are staying in Hamilton New Zealand spoil yourself and stay at the Ashlea Palms Hotel. All of the hotel accommodation rooms contain a spa bath, queen and king size beds, Sky TV, video and CD players, air-conditioning and use of the hotels heated swimming pool, gymnasium, BBQ area and children's playground. You can also use the internet cafe, business and conference services available at the Ashlea Palms Hotel Hamilton. 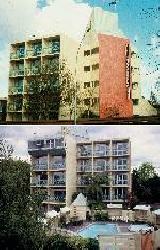 Wonderful, quality Hamilton accommodation for both business and leisure travellers. The Abbortsford Court Motel is hidden away on central Hamilton and is close to major sports, leisure and culture venues as well as numerous shops and restuarants. With spacious 1 and 2 bedroom apartment accommodation the Abbortsford Court Motel is conveniently positioned only a short drive to Claudelands, Rugby park, Waterworld, Founders theatre, sports clubs, golf course and serveral licensed restaurants with chargeback facilities. There is even a private spa, gymnasium, guest laundry, BBQ, trampoline and free off street car parking at the Abbortsford Court Motel Hamilton. The Anglesea Motel & Conference Centre is close to the Hamilton city centre, numerous restaurants and is within walking distance to the Founders theatre. This quality Hamilton accommodation features state of the art conference facilities, complimentary use of the tennis courts, squash courts and gymnasium, spa bath in most of the hotel rooms and a swimming pool for guests to relax around. If you are looking for great value hotel accommodation in Hamiton on New Zealand's North Island look no further than the Anglesea Motel & Conference Centre. Guest who choose to stay at the Aquarius Motor Inn in Hamilton will appreciate the warm, friendly and helpful atmosphere that this affordable hotel accommodation provides. The Aquarius Motor Inn id ideally located only 500 metres from the Rugby Park stadium and includes hotel facilities such as an indoor heated swimming pool, licensed restaurant, room service, BBQ area and guest laundry. There are even spa bath hotel suites available at this discount Hamilton accommodation. 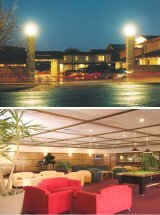 For a first class accommodation experience in Hamiton stayat the Ashwood Manor Hotel. Centrally located close to the Hamilton city centre, restaurants, hospitals, polytech, theatres and lake the Ashwood Manor Motor Lodge has a range of special features to ensure that your stay in Hamilton is both relaxing and enjoyable. This includes Sky TV, internet access, full length mirrors, bathroom make-up lights, room service, restaurant and cooked, continental or french breakfast. The Aspen Manor is situated on the south side of Hamilton just off state highway one in a quiet and secure location. This discount Hamilton accommodation provides easy access to university, hospitals, Hamilton gardens, shopping, fine dining, Claudelands Event Centre and the Hamilton airport. Each of the ground floor hotel units at the Aspen Manor are serviced daily and feature tea & coffee making facilites, Sky digital TV, free car parking, guest laundry, sauna, spa and internet access. At the Barclay Hotel Hamitlon we pride ourselves in making our luxury accommodation your home away from home. This quality Hamilton accommodation ranges from discount studio and 1 bedroom apartments right through to spacious family sized 2 and 3 bedroom apartments. With kitchen facilities in every apartment, daily servicing and private spa baths the Barclay Hotel Hamilton will satisfy the needs of even the most discerning of business of leisure traveller. Close by to this luxury Hamilton accommodation is Rugby Park and many restaurants, shops and bars. The Bella Vista Motel is the perfect Hamilton accommodation if you are looking for an affordable holiday in the North Island of New Zealand. The superior non-smoking accommodation units at the Bella Vista Motel Hamilton are serviced daily with full kitchen facilities, spa baths in some apartments and Sky TV. Positioned adjacent to restaurants, conference facilites and only a short walk to the Hamilton city centre and Rugby stadium the Bella Vista Hotel will satisfy all of your holiday or business needs. Accommodation at the Best Western Southern Cross Motor Inn in Hamilton consists of executive hotel spa suites and studio, 1 and 2 bedroom self contained apartments. All of the hotel room and apartments are serviced daily and feature Sky digital TV, video player and internet access. The hotel facilities at the Southern Cross Motor Inn include an 80 seat conference centre, licensed buffet restaurant, lounge bar area and guest laundry. This affordable Hamilton accommodation is only 700 metres from the city centre and a short 200 metre walk to the Waikato Stadium. With studio, 1, 2 and 3 bedroom apartment units and daily servicing the Fountain City Hotel is the ideal Hamilton accommodation for both business and leisure travelers in the North Island of New Zealand. The resort style hotel facilites at the Fountain City Motor Inn include an indoor heated swimming pool, massage spa pool, children's play area, trampoline, conference facilities and internet & email facilites. All of these discount accommodation apartments also feature air-conditioning, fully equipped kitchens, licensed mini bar, Sky TV and video players. Self contained apartment accommodation that is perfect for the budget conscious travaller.